Dedicated to teaching, Edwin Hinckley touched the lives of numerous BYU students, establishing a legacy that lasts today. Early BYU educator Edwin S. Hinckley often told students that when one man says something can’t be done, he is usually interrupted by someone else doing it. This may have been his classroom creed, but it also characterized Hinckley, a man dedicated to accomplishment as he pursued learning, teaching, and bettering the world around him. During Homecoming 2004, BYU will honor Edwin S. Hinckley. A legendary teacher at the turn of the 20th century, Hinckley left a considerable legacy. Teaching at BYU for 21 years, he touched the lives of hundreds of students, and through his service he extended his reach beyond the parameters of BYU to make substantial contributions wherever he lived. An uncle of Gordon B. Hinckley, Edwin S. Hinckley was born July 21, 1868, in Cove Fort, Utah, the seventh child of pioneer parents, Ira N. and Adelaide Hinckley. Known as people of refinement and integrity, they put religion, family, and education first in their lives. Hinckley’s Brigham Young Academy experiences heightened his interest in higher education, and he was one of the few teachers to heed BYU leader Benjamin Cluff’s charge to go back east to further his education. He and his wife, Adeline, moved to Ann Arbor, Mich., to pursue studies in geology at the University of Michigan, where he graduated as class salutatorian and simultaneously served a part-time mission. Another student, Nels Anderson, ’20, credited Hinckley with his decision to stay in school. Discouraged and finding himself among “kids who had not come up the rough way,” Anderson had already rolled up his bed to go home when he saw Hinckley. As he explained, “[Hinckley] listened and without my realizing, kept me an hour. He told stories and listened to mine. In the end he said, ‘I’ll gamble on you. If you agree to stay till the end of the term, I’m sure you’ll come on top. I went back, unrolled the bed and started over. By three months I was getting As.” Anderson’s book Deseret Sands was his tribute to his teacher. Hinckley left BYU to be superintendent at the State Industrial School in Ogden, Utah. He later was executive director for the Provo City Chamber of Commerce, helping promote major economic development in Utah. 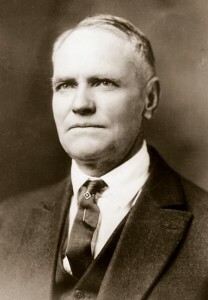 He also served as BYU’s Alumni Association president in 1897­98 and again from 1924­25. Hinckley died Nov. 15, 1929. Today Hinckley is perhaps best remembered through the Edwin S. Hinckley Scholarship, which was established by his children in 1954. The largest privately endowed scholarship BYU offers, many leaders and educators have benefited from the scholarship, including Apostle Jeffrey R. Holland, ’65, Massachusetts governor W. Mitt Romney, ’71, and former BYU president Rex E. Lee, ’60. As the scholarship reaches its 50th year, family, friends, and recipients are preparing a 2004 Homecoming reunion honoring both Hinckley and his daughter-in-law Abrelia Clarissa Seely Hinckley, ’30, after whom a second Hinckley scholarship is named.